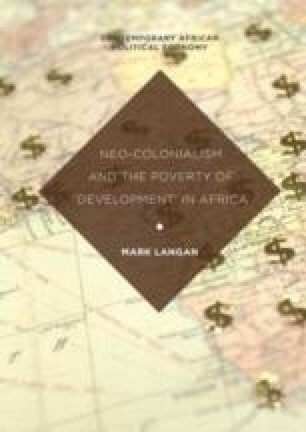 Many writings on African ‘development’ now concern themselves with new donor actors, especially China and its state-sponsored corporations. This chapter explores ‘new’ donor involvement in the continent with focus on China and Turkey. In relation to Chinese trade and aid, the chapter queries the progressive ‘development’ credentials of Chinese interventions with focus on Zambia and Angola. In both country contexts, Chinese corporations are seen to secure access to lucrative natural resources with little tangible return for the poorer citizenry. Indeed, Chinese interventions are seen to perpetuate (neo)colonial trade and production patterns and to denude the exercise of empirical sovereignty. Meanwhile, Turkish interventions under President Erodgan are seen to be couched in a benevolent discourse of humanitarian concern. Nevertheless, Turkish interests in oil in Somalia’s Puntland province combined to its arms deals, challenges the notion that Turkey offers a real alternative system to the ‘neo-colonialism’ of the West. Financial Times. (2015, February 9). China’s policy dilemma deepens on record trade surplus. Financial Times. Available at: http://blogs.ft.com/beyond-brics/2015/02/09/chinas-policy-dilemma-deepens-on-record-trade-surplus/. Accessed 13 July 2017. Human Rights Watch. (2010). Transparency and accountability in Angola. New York: Human Rights Watch. Available at: https://www.hrw.org/report/2010/04/13/transparency-and-accountability-angola. Accessed 25 Mar 2017. Human Rights Watch. (2011). You’ll be fired if you refuse: Labour abuses in Zambia’s state-owned copper mines. New York: Hyman Rights Watch. Available at: https://www.hrw.org/report/2011/11/04/youll-be-fired-if-you-refuse/labor-abuses-zambias-chinese-state-owned-copper-mines. Accessed 25 Mar 2017.
de Marques Morais, R. (2011, March/April). The new imperialism: China in Angola. World Affairs. Available at: http://www.worldaffairsjournal.org/article/new-imperialism-china-angola. Accessed 25 Mar 2017. Reuters. (2015, February 27). Update 3—jailing of Zambian ex-minister prompts calls for action on graft. Reuters. Available at: http://www.reuters.com/article/zambia-corruption-idUSL5N0W11YE20150227. Accessed 13 July 2017. Young, A. (2014, August 5). Turkey is boosting weapons exports with a focus on Africa: Here’s who benefits. IbTimes.com. Zoumara, B., & Ibrahim, A. F. (2013). China-Africa relations looking beyond the critics. Pambazuka, No. 166. Available at: http://pambazuka.org/en/category/features/87735. Accessed 7 Jan 2017.